As an iconic fashion designer, Geoffrey Beene played by his own rules and refused to follow the pack. He understood that young creative talent needs to be nurtured and supported. Designers like Alber Elbaz, Doori Chung and Stephen Dweck proudly claim Mr. Beene as their mentor. The Geoffrey Beene Foundation’s recent endowments of $5.5 million to the Council of Fashion Designers of America (CFDA) (including $2.5 million for CFDA annual Geoffrey Beene Design Scholarships), and more than $5.5 million to the YMA Fashion Scholarship Fund, mean fashion students and young designers have access to Geoffrey Beene Educational Programs and National Scholarships designed to help them master their craft and develop their own unique vision. 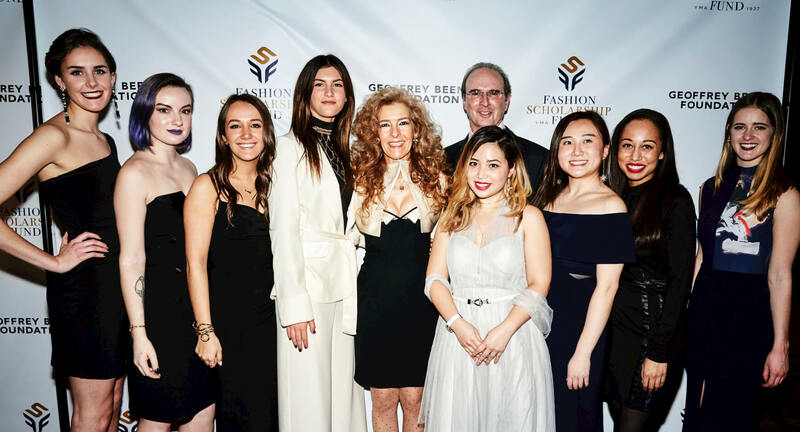 YMA and the Geoffrey Beene Foundation formed a strategic alliance with the YMA Fashion Scholarship Fund in 2007 to further the mutual goal of expanding support for students seeking careers in the Fashion Industry. The Geoffrey Beene Foundation has donated to the YMA FSF more than $5.5 million committed through 2017. 2017 Geoffrey Beene National Scholarship Award winners (left to right): first ever $35,000 scholarship was awarded to Vivian Cooper of Philadelphia University; $10,000 Emily Kinville, Univ. of Wisconsin-Madison; $30,000 Marley Isaacson, Indiana Univ. ; $30,000 Aleksija Vujicic, UCLA; Mara Hutton, Executive VP, Geoffrey Beene Foundation; Tom Hutton, President & CEO, Geoffrey Beene, LLC; $10,000 Vivian Tai; $10,000 Joanne Kim, Cornell Univ. ; $10,000 Amanda Nyamache, Academy of Art Univ. ; $30,000 Kaley Suero, Wharton School, Univ. of Pennsylvania. 2015 Geoffrey Beene National Scholarship Awards presented by Mariano Rivera and introduced by Mara Hutton, Executive Vice President, Geoffrey Beene Foundation. 2015 YMA FSF Geoffrey Beene National Scholarship Awards Mission. 2014 YMA FSF Geoffrey Beene National Scholarship Awards Mission Video. Sizzle Reel: 2014 YMA FSF Geoffrey Beene National Scholarship Awards Dinner. Alber Elbaz accepting the 50th Anniversary Geoffrey Beene Fashion Impact Award at the 2013 YMA FSF Geoffrey Beene National Scholarship Awards Dinner. 2013 YMA FSF Geoffrey Beene National Scholarship Awards Dinner. The evening raised $1.9 million to support scholarships, mentoring and internship programs, making it one of the most successful dinners in the organization’s 76-year history.